Do you ever wonder who you have to thank for the powerful desktop or laptop you are now using for practically everything you do? You might say all thanks should be given to the computer companies of today but in fact, you have Charles Babbage to thank. The name might not be familiar to you just yet but read on because pretty soon, “Charles Babbage” will be on your mind every time you use your computer. Charles Babbage was born on Dec. 26, 1791 in England. He was a polymath and became a mathematician, mechanical engineer, inventor, and philosopher. He contributed to many different scientific fields but his most famous work is designing a programmable computing device. Charles Babbage is considered the “father of the computer” and is given credit for devising the first ever mechanical computer. His design served as the blue print for other, more complex machines. In 1991, a functioning Difference Engine No. 2 was built based on Babbage’s original drawings at the Science Museum, London.It consisted of 8,000 parts, weighed five tons, and measured 11 feet long. The engine was built under conditions that were available during the 19th century. In 2000, the Science Museum also completed the printer Babbage had designed for the difference engine. There is some dispute about the birthplace of Charles Babbage but as stated in the Oxford Dictionary of National Biography, Babbage was born at 44 Crosby Row at Walworth Road in London, England. A blue plaque has been placed along the junction of Walworth Road and Larcom Street to commemorate the birth of this brilliant man. 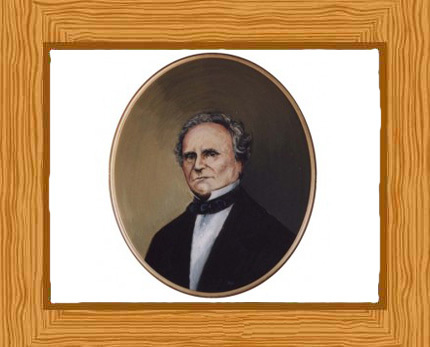 Charles Babbage was one of four children born to Betsy Plumleigh Teape and Benjamin Babbage. His father was a banker and he was the partner of William Praed. Together they founded Praed’s & Co. of Fleet Street London in 1801. When he was 8 years of age, Charles Babbage was sent to the countryside at Alphington near Exeter for schooling to help him recover from a fever that had nearly ended his life. Later he also attended the King Edward VI Grammar School in Totnes, South Devon but due to his poor health he returned home and was educated by private tutors. Later still, he attended the small Holmwood academy in Enfield, Middlesex. The academy had a library and there Babbage’s love of mathematics blossomed. At the age of about 16 or 17 Babbage went back to Totnes to study and also had a tutor from Oxford. It was under this tutor that he learnt the Classics so that he could be admitted to Cambridge. Babbage began his studies at Trinity College in Cambridge in October 1810 and he moved to Peterhouse College, Cambridge in 1812 where he was the top mathematician. He graduated two years later in 1814. While in Cambridge, he teamed up with notable names like John Herschel and George Peacock to form the Analytical society. He was also a member of other clubs including the Ghost Club which investigated supernatural happenings and The Extractors Club where members professed to liberate one another from the madhouse in the event that anyone was ever committed. Babbage became a lecturer at the Royal Institution where he lectured about astronomy. In 1816, he was elected a Fellow of the Royal Society. In 1820 Babbage helped found the he Astronomical Society and in 1824 he won its Gold Medal, “for his invention of an engine for calculating mathematical and astronomical tables”. From 1828 to 1839 Babbage was Lucasian Professor of Mathematics at Cambridge University. Mathematical tables were important in Babbage’s era for use in navigation, science and engineering. They were calculated by hand and then compiled into tables. Errors were sometimes made either in the calculation or in the compiling of the tables. It is with this background that Babbage decided to design a mechanical device that could perform calculations. Such a machine would always be accurate and would save time and money. Babbage began building his first small model of the calculating engine in 1819 and it was completed in 1822 (Difference Engine 0). The machine calculated and printed mathematical tables and was powered by cranking a handle. 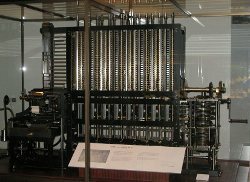 The machine was called a “difference engine” after the mathematical theory on which the machine’s operation was based. The British government was interested in his machine and Babbage was given £1,700 to begin on a full scale machine (Difference Engine No. 1) . It was designed to calculate and tabulate polynomial functions. Over the following years, over £17,000 would be spent on the project. The working difference engine at the Science Museum in London. Image: Geni. Unfortunately making the parts required was costly. In 1832 a small working portion was built. However work on the full scale difference engine stopped in 1833. If the difference engine had been built it would have had over 25,000 working parts, weighted over 13 metric tons and have been over 8 feet (2.4m) tall. In 1837, Babbage became interested in building a more ambitious analytical engine. This would be more powerful than the original difference engine and when built would be the first working computer for general-purpose computation. It was programmable by using punched cards, an idea borrowed from the Jacquard loom used for weaving complex patterns in textiles. A trial part was built but again it was never fully completed. He also designed a printer for his new engine. 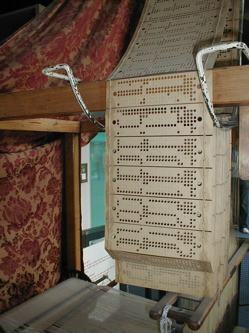 A Jacquard loom and punch cards. A first step in machine language. Image: George Williams. His machines were considered as one of the very first mechanical computers ever to be invented. The fact that they were not actually built was not due to a design flaw but rather, it was due to lack of funding. While the machines he designed were mechanical and bulky, the basic concept is similar to the modern computer. It is for this reason why he is often looked at as one of the pioneers of computers. Babbage published “On the Economy of Machinery and Manufactures” in 1832 about industrial production which was well received. In the book, it described what is now known as the “Babbage Principle” which noted the advantages of using division of labor in factories. He wrote a natural theology book “On the Power, Wisdom and Goodness of God, as manifested in the Creation” in 1837. In 1838, Babbage invented the pilot (also called a cow-catcher), which is the metal frame attached to the front of locomotives that clears the tracks of obstacles. Babbage also invented an ophthalmoscope, which is used in eye examinations. In 1814, Babbage married Georgiana Whitmore. They had eight children together, but only three lived beyond childhood. His wife died in 1827. Charles Babbage died on Oct. 18, 1871, aged 79. He is buried in the Kensal Green Cemetery in London. Cause of death was “renal inadequacy”.